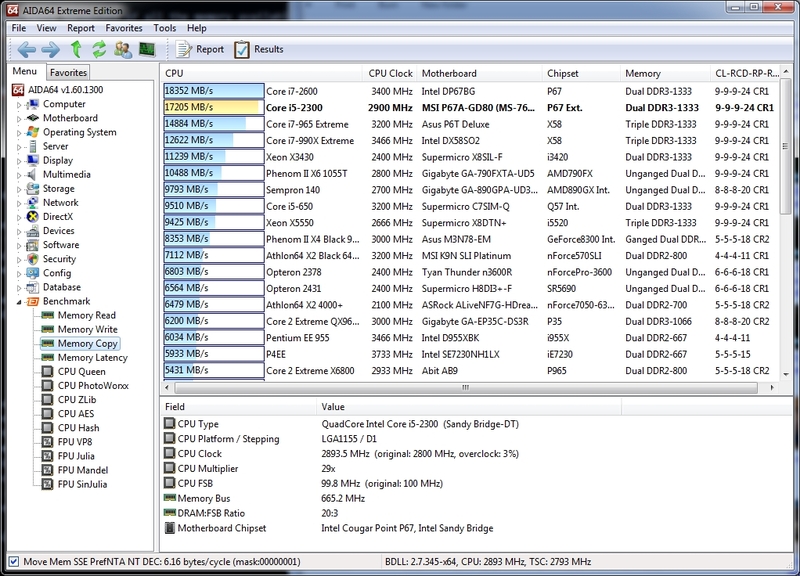 Next up in our list of benchmarking tools is AIDA64, a suite that rivals Sandra for thoroughness. Intel is clearly doing something right with the Sandy Bridge architecture; the i5 2300 scored higher than all the quad-core CPUs, save only those with hyperthreading—and thus more logical threads available. This benchmark stresses the integer arithmetic and multiplication execution units of the CPU and also the memory subsystem. Due to the fact that this test performs high memory read/write traffic, it cannot effectively scale in situations where more than 2 processing threads used. For example, on a 8-way Pentium III Xeon system the 8 processing threads will be “fighting” over the memory, creating a serious bottleneck that would lead to as low scores as a 2-way or 4-way similar processor based system could achieve. CPU PhotoWorxx test uses only the basic x86 instructions, and it is HyperThreading, multi-processor (SMP) and multi-core (CMP) aware. Again the i5 2300 shows its muscle, beating out all but its own i7 sibling and a pair of server-grade CPUs. 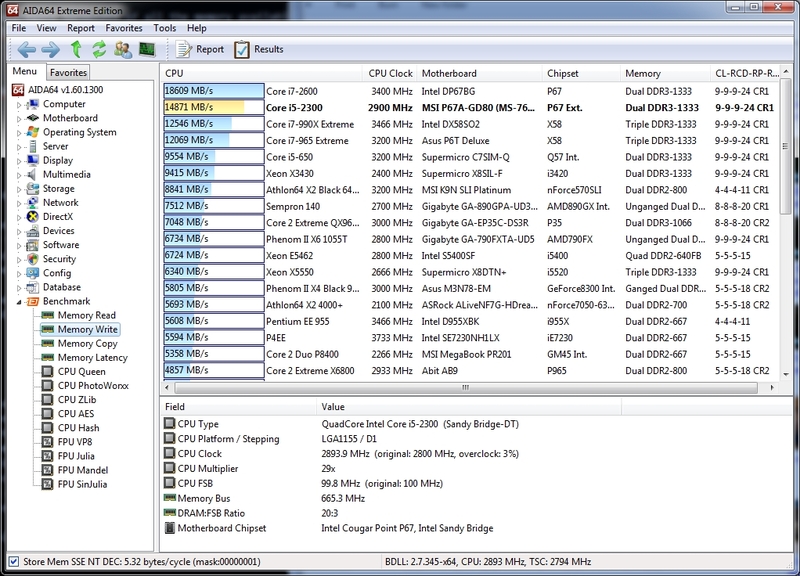 Here the i5 2300’s performance is somewhat more modest, but again the pack ahead of it is filed with high-end enthusiast and server CPUs. CPU AES test uses only the basic x86 instructions, and it’s hardware accelerated on VIA PadLock Security Engine capable VIA C3, VIA C7 and VIA Nano processors; and on Intel AES-NI instruction set extension capable processors. The test is HyperThreading, multi-processor (SMP) and multi-core (CMP) aware. 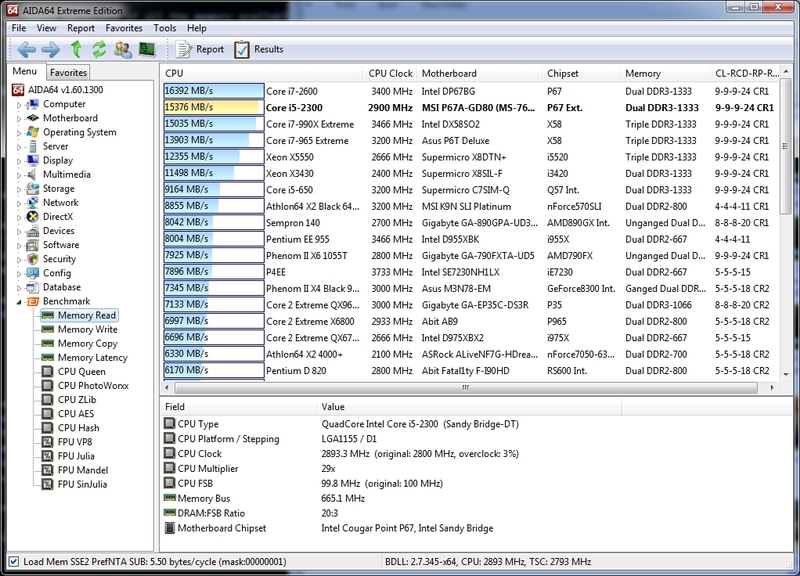 Here’s where the new AES instructions in the Sandy Bridge line show their worth: the i5 2300 beats out all but its i7 sibling in this test, and even squeezes into second ahead of a generally much beefier i7 from the Nehalem line. This benchmark measures CPU performance using the SHA1 hashing algorithm defined in the Federal Information Processing Standards Publication 180-3. The code behind this benchmark method is written in Assembly, and it is optimized for every popular AMD, Intel and VIA processor core variants by utilizing the appropriate MMX, MMX+/SSE, SSE2, SSSE3, or AVX instruction set extension. CPU Hash benchmark is hardware accelerated on VIA PadLock Security Engine capable VIA C7 and VIA Nano processors. Here the i5 2300 starts to fall behind a bit, mostly due to raw clock speed and number of available threads. Even so, the results are nothing to sneeze at, with our test system coming in the top 20. This benchmark measures video compression performance using the Google VP8 (WebM) video codec Version 0.9.5 (http://www.webmproject.org). FPU VP8 test encodes 1280×720 pixel (“HD ready”) resolution video frames in 1-pass mode at 8192 kbps bitrate with best quality settings. The content of the frames are generated by the FPU Julia fractal module. The code behind this benchmark method utilizes the appropriate MMX, SSE2 or SSSE3 instruction set extension, and it is HyperThreading, multi-processor (SMP) and multi-core (CMP) aware. I’m starting to see a pattern here: our test system is smoking everything else with 4 threads, and staying competitive with the 6- and 8-thread systems. This benchmark measures the single precision (also known as 32-bit) floating-point performance through the computation of several frames of the popular “Julia” fractal. The code behind this benchmark method is written in Assembly, and it is extremely optimized for every popular AMD, Intel and VIA processor core variants by utilizing the appropriate MMX, MMX+/SSE, SSE2, SSSE3, or AVX instruction set extension. FPU Julia test is HyperThreading, multi-processor (SMP) and multi-core (CMP) aware. 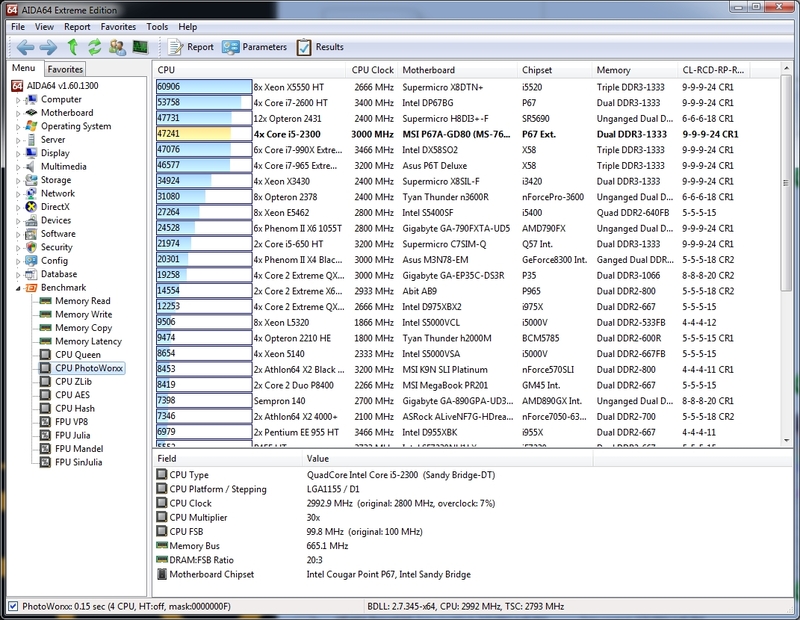 Clearly the beefy vector execution units on the i5 2300 are serving us well, with our test system smoking every desktop processor on the market save only a handful of Intel’s finest. This benchmark measures the double precision (also known as 64-bit) floating-point performance through the computation of several frames of the popular “Mandelbrot” fractal. The code behind this benchmark method is written in Assembly, and it is extremely optimized for every popular AMD, Intel and VIA processor core variants by utilizing the appropriate MMX, MMX+/SSE, SSE2, SSSE3, or AVX instruction set extension. FPU Mandel test is HyperThreading, multi-processor (SMP) and multi-core (CMP) aware. I’m running out of creative ways to say “beats almost every desktop CPU on the market”, but that’s a pretty good problem to have. Here the poly-threaded beasts don’t even have much of a lead. Here’s where both clock speed and number of threads makes a difference; our test system, while still quite blisteringly fast, falls behind the rigs with more and faster logical cores. Memory bandwidth benchmarks (Memory Read, Memory Write, Memory Copy) measure the maximum achiveable memory data transfer bandwidth. The code behind these benchmark methods are written in Assembly and they are extremely optimized for every popular AMD and Intel processor core variants by utilizing the appropriate x86, MMX, 3DNow!, SSE, SSE2 or SSE4.1 instruction set extension. 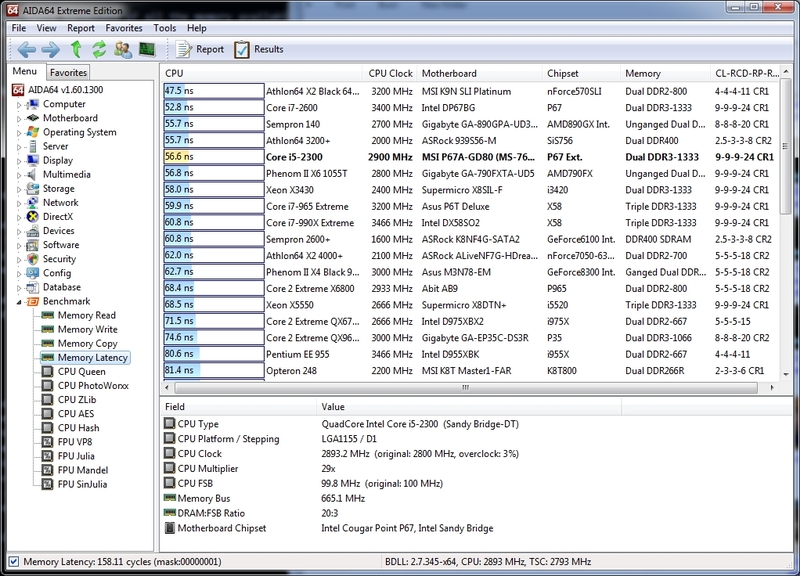 Eerily, the rankings on all three benchmarks are identical, with the i7 2600 and i5 2300 taking the top two spots. The Sandy Bridge architecture is showing some blistering throughput here. 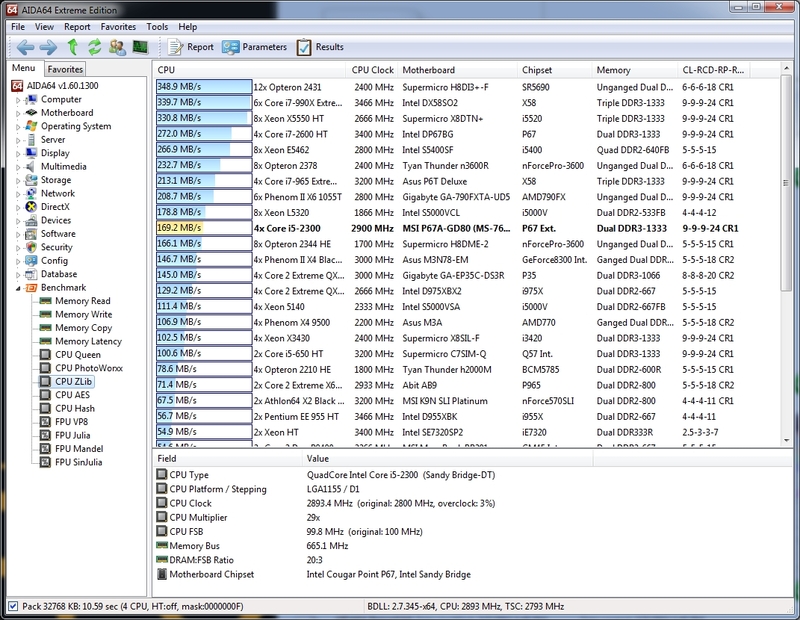 Here is where the P67 chipset shows its strength: the memory latency is solidly in the top five.